Sometimes planning seems like an exercise in futility, but it can be helpful when preparing to image far from home. My first 2015 star party trip is to the Two Rivers Spring Star Party at the May new moon. This is located a little north of Barry, IL on a private farm. There's no power except for recharging batteries, so I'll be running from my big batteries all three nights. What's to image? There's a cluster of five ALBN objects to go after. Fitting neatly into a 135mm field are LBNs 8, 10, 11, 19, and 1122. All are emission nebulae. 1122 is a brightness four, 11 a five, and the rest sixes. This is an all-night group, complete with a meridian flip around 2 A.M. if the four hours from 10 to 2 aren't adequate. This should make a nice LRGB image! Assuming there's a second clear night, I'll go after something not possible from Minnesota. 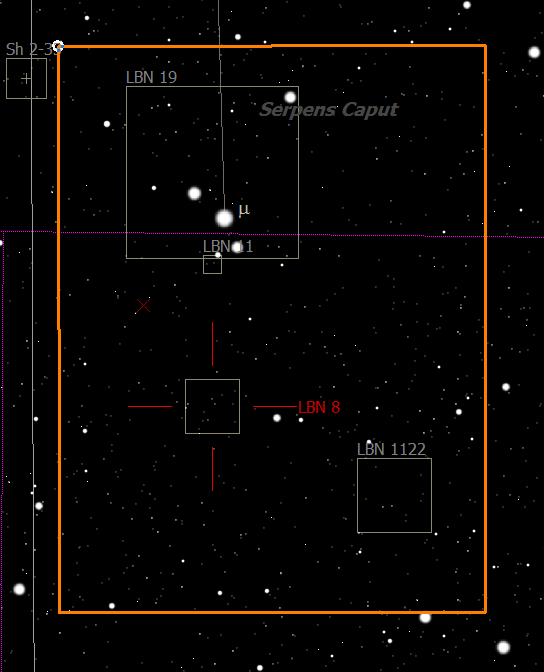 LBN 1091 transits at 12:49 at an altitude of almost 16 degrees. This has an LBN brightness of 6, so it's going to be difficult if not impossible. The rest of the ALBN objects I have to do are better imaged later in the summer. If there's a third night of clear sky I'll do a pretty picture. Maybe an LRGB of the Antares area at 135mm. What're the chances of that?